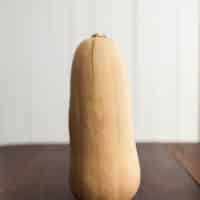 For whatever reason, I nearly always cube my butternut squash before cooking (whether it be roasting, steaming, or pan frying). It’s rare that I cook the squash whole. I think it’s because in my mind, the whole squash takes longer to cook but in the end, it’s less preparation and really, not much more time. However, when I do cook the whole squash, I steam roasted squash (putting cut side down in a roasting pan with 1/4″ of water). It’s how I saw my mother always cook acorn squash and so it stuck with me. It leaves the squash really nice and soft, perfect for a sauce! I’ve been keeping butternut squash puree in my refrigerator (along with sweet potato and a few other odds and ends) more Mack to try. We’ve been dipping our toe into solid foods and so far, he’s been a maniac. Sweet potatoes are by far is favorite (my child) but butternut squash is a close second. I’m approaching this from an angle of roast once, have many meals/puree. Of course, for the majority of you who are not trying to feed a baby, use the leftover butternut squash puree in soups, mac and cheese, or use one-half to make twice baked butternut squash. Spinach: I used the spinach here to add just a bit of color and because I had a handful of spinach that needed to be used. A heartier green, like kale or chard, would also work but I would toss it into the pasta water to let soften before combining with the sauce. Cilantro Pesto: I had a ragged bunch of cilantro in the refrigerator that was near the end and I made this cilantro pesto. I shared the simple recipe on instagram, so feel free to pop over and grab that! In a blender, puree the ingredients for the sauce. Taste and add salt/chili paste as desired. Start with a pinch of salt and a 1/4 teaspoon of chili paste and add from there, set aside. Bring a pot of water to a boil and cook noodles according to package. Drain, toss with spinach, and once spinach has started to wilt, rinse under cool water until noodles are warm but not hot. 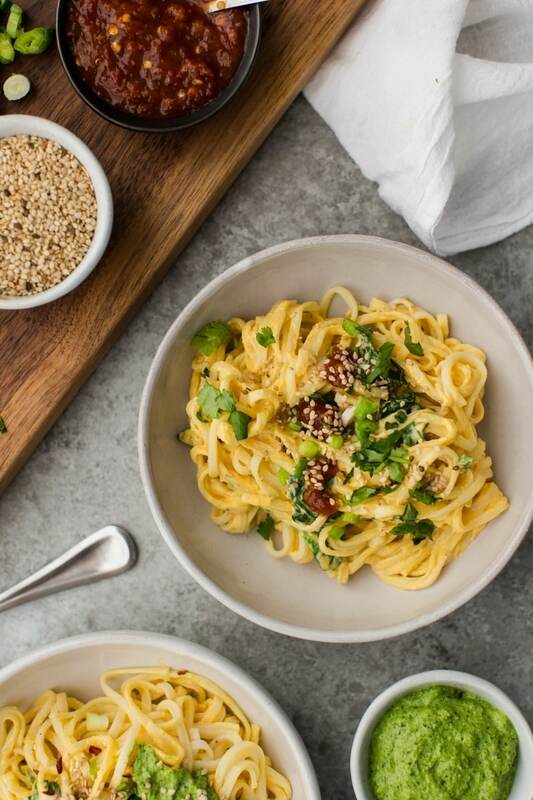 Toss noodles with sauce, divide into two bowls, and top with desired toppings. + To roast butternut squash, preheat oven to 400˚, cut in half length-wise, and place cut-side down in a roasting pan. Add 1/4″ of water and bake until squash is tender, 25 to 45 minutes depending on how large the squash is. Wow, this looks super delicious I have to try it! This is a very interesting recipe, seems so tasty. I think I’ll have to try this! Sounds absolutely delicious! Aw, and Mack in that monkey costume, cuteness overload for sure! this is super simple yet looks so amazing! This is the perfect easy and healthy dinner 🙂 Pinned! I love roasting butternut squash whole- whenever there’s time that’s the way I do it. I also love how the skin just slides right off after the squash has collapsed. I usually just throw it into soup, but this looks fantastic. I love using squash and a noodle bowl is always yummy! Fantastic use of tahini. I’ll have to try this one soon! This sounds so beautiful! Isn’t it funny how meals start to bend to accommodate your baby? Its so fun to see them experience foods for the first time. My babe LOVES sweet potato, but is unsure on squash… so far…! Holy– I thought I was asome sort of a genius when I came up with tahini-olive oil-water based .alredo. sauce with butternut squash for pasts, but apparently I’m not the only one with this idea! I have a good feeling about this version! , I’ll definitely give it a go! And for anyone wondering, it’s SO WORTH IT. Delicious. 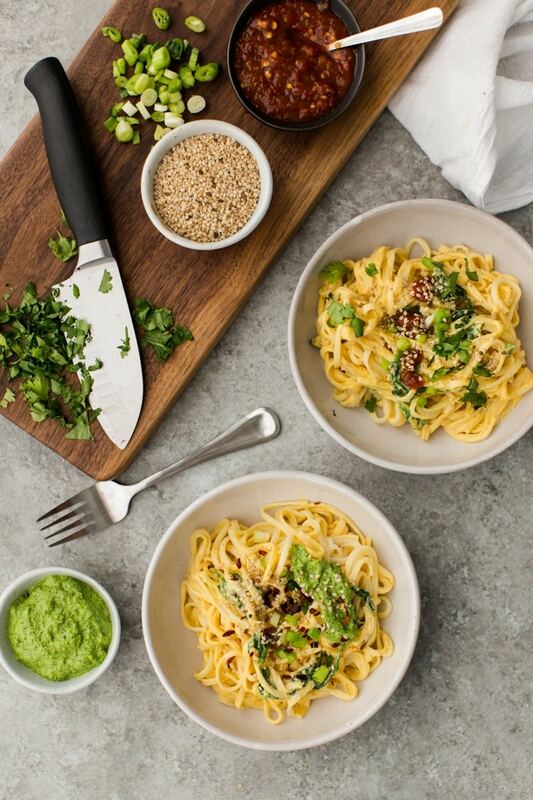 Made this last night – without the cilantro pesto – and it was amazing! I used green lentil pasta since I am gluten free. Do you perhaps have a recipe for a homemade chili sauce? It’s difficult to find anything other than sweet chili sauce where I live. I do not but you could also just use crushed red pepper for a bit of heat!